From Chris Menmuir, Sec’ and organizer of this event. I’d like to say many thanks to Gerry Bond and Malcolm Brown for their enthusiastic support today, and thanks to Anne Chadwick who delivered a box of public-friendly leaflets and a seemingly inexhaustible supply of “space bugs” for the children. We were located right next to the music tent, which despite causing us to shout for most of the day, meant that we had a steady stream of visitors. 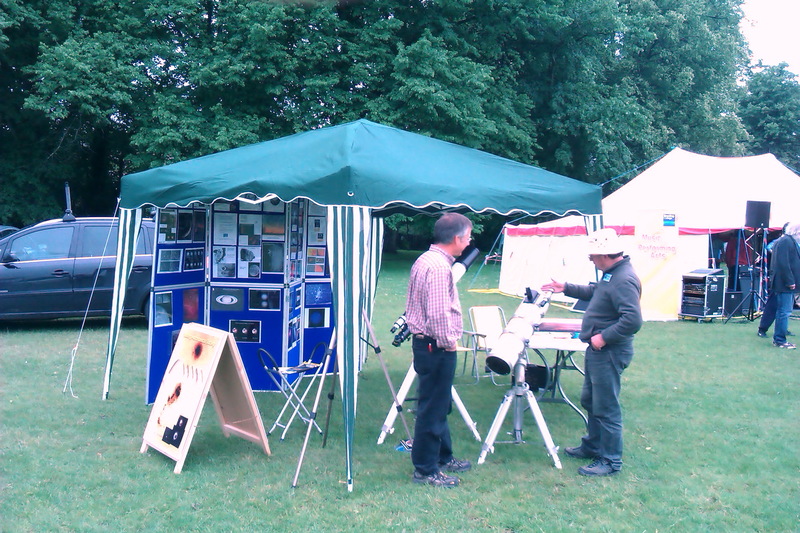 Amongst the hordes of children desperate to get to grips with the three telescopes on display, we had several potential new members and a few community group leaders. Expect me to ask for volunteers to help with talks and displays over the next few months! And if you’ve got any suggestions for how to remove sticky fingerprints from every single component of a telescope PLEASE let me know … Although we didn’t get to observe the Sun, we didn’t get wet either! This entry was posted by gbond on June 12, 2012 at 23:17, and is filed under Events. Follow any responses to this post through RSS 2.0.You can leave a response or trackback from your own site.